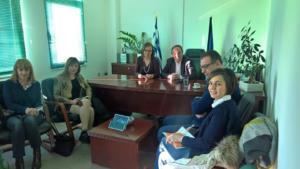 Project presentation at the premises of the Primary Education Directorate of the Prefecture of Larissa. At the premises of the Primary Education Directorate of the Prefecture of Larissa, an informative and promising meeting was held for the European program Erasmus + entitled “Water World Adventure”. The Coordinator, University of Thessaly, introduced and welcomed the Directorate to the WWA and its objectives raising awareness on the importance on the marine environment for pre school education.